I recently had the pleasure of speaking at MediaGuardian's Changing Media Summit alongside some of the biggest names in the industry including, to name a few: Darren Childs, CEO of UKTV; Michael Comish, CEO of Tesco Digital Entertainment; Lewis D'Vorkin, CPO at Forbes Media; and Alexander Koppel, CCO, Red Bull Media House. The one topic that kept coming up in almost every panel or presentation was "monetisation"–and in reference to everything from social data to mobile content. It was exciting to hear about real digital strategies that major broadcasters, publishers and brands are implementing today, and from which they're seeing solid returns. But it was also refreshing to learn about their challenges, as it was quickly evident that they are not the only ones facing them. By the end of 2012, the number of mobile connected devices will overtake the number of people on the planet. That puts a significant amount of pressure on publishers to be able to deliver content to a growing number of connected platforms and places where consumers are expecting and demanding it. The increasing volume of high-quality video content found online today is a key driver of consumption rates as well. What we're also seeing today is that not only media companies but brands of all kinds are generating and distributing high-quality, well-produced video that is reaching millions of people worldwide. A great example of this is Red Bull. While it is traditionally an energy drinks manufacturer, it has become one of the most engaging content producers in the world. Last year, the company broadcast Felix Baumgartner free-fall sky dive from over 120,000 feet in the air. The live broadcast reached more than 40 networks in 50 countries and drew in 8 million concurrent viewers on YouTube, generating more than 3.1 million tweets. What's more, the initial photo of his safe landing was shared nearly 30,000 times in 30 minutes. Setting world records across the board for this event, Red Bull proved it understands the value of great content. It continues to invest in exceptionally high-quality content, primarily around extreme sports, that is guaranteed to draw a crowd, connect with the audience, and is available to virtually anyone around the globe. With more and more content being made available on multiple devices and brands competing for the attention of viewers like never before, the trend toward mobile multitasking is becoming more mainstream. A recent Nielsen survey found that 80 percent of U.K. tablet users, and 78 percent of smartphone users browse the Web while watching TV. The most common device pairing in these scenarios is the TV and tablet and, importantly, 22% of that simultaneous device usage is complementary, according to Google. 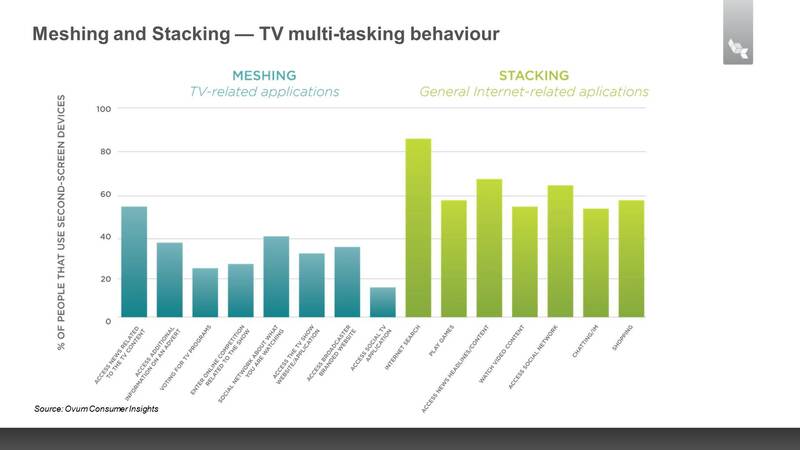 Looking at the TV and tablet or smartphone combination, there are two types of multitasking that we're seeing - meshing and stacking. Meshing is, as mentioned in the Google report above, the consumption of complementary content that is specifically related to the programme on TV. It is usually bespoke content or services created only for a certain platform and programme, but there is a limited amount available at the moment. "Stacking" on the other hand is more general Internet activity such as search or social media, which is much more common. In the U.K., reality TV shows such as The Only Way Is Essex and BBC Two's Top Gear are the most tweeted about TV Programmes on Twitter. Both programmes have a highly engaged fan base that interact with each other, or the characters, and react in real time to events on screen. But while the trends are evident, there's a common concern that multitasking is distracting eyeballs away from the main screen and doesn't allow for full audience engagement. Dual screen apps are a happy compromise and natural next step in the evolution of content consumption. Capitalising on multitasking trends, they enable viewers to use applications that simultaneously present content, interactive options and data on both a touch device and TV, with the ability to control information on the HDTV via the handheld device. We've talked about this topic at length, with our executive chairman Jeremy Allaire really stoking the fire in his original post: Apple Television, AirPlay and Why the iPad Is the New TV Apps Platform on All Things D, but recently our chief technology officer Albert Lai has taken the conversation further and broken down the concept of dual screen to illustrate the most suitable devices (tablet vs. smartphone). This type of dual screen or second screen experience does away with the notion of distracted eyeballs as it enhances and augments the viewing experience. It allows all of the additional content, such as social media, to be delivered directly into the app, creating tremendous opportunities for monetisation for any content owner. I think Lewis D'Vorkin, Chief Product Officer at Forbes Media put it best when he stated simply that: "Everybody is experimenting. Anyone who isn't won't survive." If you would like to see my presentation in full, please visit this link. Also, be sure to check out content from the Changing Media Summit online here.